For other universities with a similar name, see Wesleyan University (disambiguation). Scientia et pietas (Latin); "Knowledge and loyalty"
Walker & Weeks; et al. The school was chartered on December 23, 1836, as the Georgia Female College; it opened its doors to students on January 7, 1839. The school was renamed as Wesleyan Female College in 1843, when its affiliation changed from the Methodist-Episcopal Church to the Methodist Episcopal Church, South. The college shortened its name in 1917 to the present Wesleyan College. Wesleyan has the world's oldest alumnae association, begun in 1859. Wesleyan College is the birthplace of the first sororities in the United States: the Adelphean Society in 1851, now known as Alpha Delta Pi, and the Philomathean Society in 1852, now known as Phi Mu. The two sororities together are referred to as the "Macon Magnolias". In 1914, the school disbanded sororities on its campus. Wesleyan College has an undergraduate student population of around 700. It has a student-faculty ratio of 8:1 and an average class size of 21 students. Students from more than 20 states and over 20 countries around the world attend the school each year. Wesleyan offers 29 majors, 32 minors, and eight pre-professional programs. Students can earn a bachelor of arts, bachelor of fine arts, or bachelor of science in nursing degree. Wesleyan is affiliated with the United Methodist Church. For many consecutive years, Wesleyan College has been named among the Best Colleges by Princeton Review. Additionally,Forbes ranks Wesleyan on its list of best college buys. Wesleyan College has a 200-acre (800,000 m²) campus dotted with revivalist Georgian style brick buildings and features a 6.3 acre (25,000 m²) lake, Foster Lake. Candler Hall (Candler Alumnae Building) was built in 1946 and was presented to the college by the late Judge John Slaughter Candler of Atlanta in memory of his parents, Samuel and Martha Beall Candler. It was designed by renowned architect Phillip Shutze with the assistance of librarian Katharine Payne Carnes, and originally housed the campus library. Candler Hall was renovated in 1971 as the Candler Alumnae Center and is currently home to the Office of Alumnae Affairs, the Office of Institutional Advancement, the Oval Hall ballroom, and the Benson Meeting Room. The Loggia is a two-level portico connecting the Olive Swann Porter Building with Persons Hall. The top-level balcony overlooks the courtyard between the residence halls and the campus fountain. It is revered for its exceptional architectural design and marble columns and staircase. The Loggia has been a symbol of Wesleyan College since its construction in 1928. The Lucy Lester Willett Memorial Library is a three-story Georgian-style brick building that was constructed in 1968 and is dedicated to the memory of Lucy Lester Willett, class of 1881. During the 2016-2017 school year, Willett Library underwent extensive renovations, opening a new 24-hour student academic center on the first floor of the building, complete with study carrels, computer labs, conference rooms, a testing center, the campus writing center, and a second-floor lounge with sitting areas, televisions, and vending machines. The library also houses the college's branch of the Confucius Institute. The Munroe Science Center houses the biology, chemistry, nursing, neuroscience, and environmental science departments. Built in 2006, the 42,000 square foot building was made possible by the generosity of the Munroe sisters and their families. The Munroe science center boasts numerous teaching laboratories, two classrooms, modern research labs for faculty-student research, animal facilities, a roof-top greenhouse, an astronomy observation deck, and the Center for Women in Science and Technology. On the west wing of Munroe is the nursing wing which houses the nursing classroom and state of the art nursing simulation lab. The Olive Swann Porter Student Life Center (OSP) was built in 1928 in remembrance of the wife of James Hyde Porter, a long-time trustee of Wesleyan College. Furniture, antiques, and paintings from the college's extensive collection can be found throughout the building, most notably in the Burden Parlor and Manget Dining Room. Many offices of the Division of Student Affairs are housed in the Olive Swann Porter Building, including Health Services, the Center for Career Development, and the Office of the Dean of Students. OSP also contains the Anderson Dining Hall, Hurdle Café, Trice Conference Room, campus bookstore and post office, Lane Center for Service and Leadership, Belk Student Leadership Suites, and music practice rooms equipped with pianos. The Olive Swann Porter Building is connected to the Persons and Banks residence halls. The Porter Family Memorial Fine Arts Building was completed in 1954 and proudly houses the impressive Goodwyn-Candler-Panoz Organ, donated to the college by Asa G. Candler, Jr. of Coca-Cola fame, in its 1,129-seat auditorium. The Porter Family Memorial Fine Arts Building contains classrooms, offices, and studios for the college's music and theatre departments, as well as the east and west wings of the Cowles Myles Collier Art Gallery, and the Porter-Grassmann Studio Theatre used for student-produced plays and dance performances. Porter Gymnasium was built in 1928 and includes a heated swimming pool, a weight room, and a gymnasium floor marked for all indoor activities with bleacher seating for 700 spectators. Classrooms, dressing rooms, a dance studio, an athlete lounge, and shower baths are housed inside the building, as well. Tate Hall was one of the first academic buildings, along with Taylor Hall, on Wesleyan College's new Rivoli campus in 1928. It now contains classrooms and offices for the college's communications, women's studies, English, history, modern languages, religion, philosophy, and mathematics departments. The President's Office, Business Office, Registrar's Office, and other administrative offices are located on the first floor of Tate Hall. 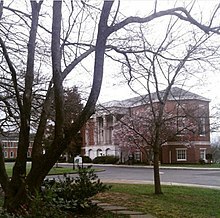 Taylor Hall was one of the first academic buildings, along with Tate Hall, on Wesleyan College's new Rivoli campus in 1928. Taylor Hall originally housed the school's science departments, but following renovations in 2009-2010, the building now houses laboratories and classrooms for education, physics, psychology, and business. The building also contains the 200-seat Peyton Anderson Amphitheatre on its ground floor. Huckabee Hall houses the Office of Admissions. Pierce Chapel opened in 2015 and sits on a knoll overlooking Foster Lake. The chapel has a capacity of about 300 in the sanctuary, which is used primarily for worship services and occasionally as a venue for recitals, concerts, special events, and weddings. The Corn Center on the lower-level of the chapel provides meeting space for faith-based programs, campus groups, and the Chaplain's office. The Valeria McCullough Murphy Art Building was built in 1964 and contains 10,000 square feet of floor space designed exclusively for the teaching of the studio arts, art history, and computer graphic design. The building houses faculty offices for the college's visual arts department and is also the location of the Frances and Dennie McCrary Art Gallery used for faculty, student, and professional exhibitions. There are four major student boards: CRU (Council on Religious Unity), CJA (Council on Judicial Affairs), CAB (Campus Activities Board), SRC (Student Recreation Council), which are represented as a part of SGA (Student Government Association). Wesleyan boasts the Nu Omega chapter of Alpha Kappa Psi, the professional business fraternity. It also has over 25 special interest clubs, academic honor societies including the Phi Kappa Phi, Beta Beta Beta and Omicron Delta Epsilon; musical groups, art clubs, service organizations, religious groups, and departmental leadership groups. Banks Hall was built in 1928 and houses freshmen. It is connected to the Olive Swann Porter Building via a breezeway. Elizabeth Turner Corn Hall North and Ernest & Pauline Corn Hall South were opened in 1999. Each of these three-story buildings contains private furnished rooms (each with private bath) arranged in four-person suites and sharing a fully equipped kitchen, laundry facilities, and fully furnished living/dining room. There is also a small atrium on the lawn between the two buildings. Upperclassmen are housed in the apartments, and Elizabeth Turner Corn Hall exclusively houses seniors, as well as contains a deluxe "Alumnae Suite" for visitors to the campus. Hightower Hall was built in 1963 and houses upperclassmen. It contains a piano lounge in its foyer, as well as some of the most coveted rooms on the campus with its views of Foster Lake. Jones Hall was built in 1959 and contains the Wesleyan College Center for Community Engagement and Service, as well as a conference room and an overnight visitor's suite on the first floor. The second and third floors of the building house upperclassmen. Jones Hall's Mary Bennet Cox Dunwody Terrace, a popular event venue, is located behind the building and overlooks the azalea garden at the edge of Foster Lake. Persons Hall was built in 1928 and houses upperclassmen. The building is connected to the Wortham Residence Hall, as well as the Olive Swann Porter Building via the Loggia. Wortham Hall was built in 1928 and houses freshmen. Wortham Hall is connected to Persons Hall via a breezeway, as well as an overhead "bridge" between the two buildings. There are several popular events of the International Cherry Blossom Festival every springtime, such as the grand finale fireworks display. Porter Auditorium was once the home of the Macon Symphony Orchestra, and it still hosts many musical and theatrical events and competitions. Wesleyan's athletes were Pioneers until becoming Wolves in fall 2013. They play in the NCAA Division III. The Wolves have 5 varsity sports: basketball, cross-country, soccer, softball, and tennis, and the IHSA equestrian team. Wesleyan competes in the USA South Athletic Conference of NCAA Division III. Mathews Athletic Center was donated to the College by Trustee George Mathews in memory of his sister, Mary Ann Mathews Pease '44, the facility includes soccer and softball fields and tennis courts. The center provides weekly yoga, tai chi, ZUMBA, cycle, cardio and strength training classes, and more. Nancy Ellis Knox Equestrian Center is located north of Foster Lake and hosts the college's two IHSA (Intercollegiate Horse Shows Association) teams. The center includes two riding arenas, turnout paddocks, a 24-stall barn, and classroom. Instruction is also offered to the Macon community through the Community Horsemanship Program. The center's academic program is the Equine-Assisted Therapy minor. The school colors are deep purple and lavender. ^ "America's Best College Buys". Forbes. 2009-05-08. Retrieved 2014-08-20. 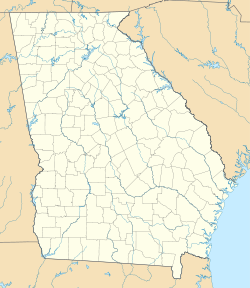 Wikimedia Commons has media related to Wesleyan College, Macon, Georgia. This page was last edited on 31 October 2018, at 23:57 (UTC).